We continue an annual tradition, as our group of knowledgeable reviewers take this month to list their Top Ten blues discs for the previous year. 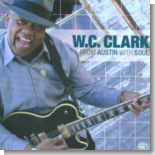 W.C. Clark's From Austin With Soul and Jody Williams' Return Of A Legend turned up on more lists than just about any other disc this year. See all of the lists in the Pick Hit section. We make a slight detour with this month's Surprise pick, featuring for review a book instead of a CD --- Can't Be Satisfied - The Life and Times of Muddy Waters, by Robert Gordon. Alligator Records digs deep into their vast archives for three budget-priced samplers --- Crucial Chicago Blues, Crucial Guitar Blues and Crucial Harmonica Blues. The trio of "crucial" recordings is featured in this month's Flashback section. This month's What's New section includes new releases from Bernard Allison, Gary Primich, Deborah Coleman, Seattle techno soul band Maktub, Portland's Duffy Bishop, Lester Chambers, Jim Suhler, Peter Wolf (formerly of the J. Geils Band), Calvin Owens, and more.